Introduction: Minimally Invasive Surgery (MIS) leads to a reduced sense of touch and diminished haptics (force feedback) in comparison to open surgery. This increases the potential for excessive force application during tissue manipulation. There are little data regarding tissue damage resulting from forces routinely applied in MIS. The purpose of this study is to systematically characterize tissue damage as a function of compressive stress at the MIS grasper-tissue interface. Methods: Controlled compression stresses routinely seen in MIS were applied to in vivo porcine liver and small bowel using a motorized laparoscopic grasper. Stress was varied between magnitudes of 0-300 kPa and was applied for durations from 10-60 seconds. Neutrophil infiltration was identified and quantified in small bowel using an anti-myeloperoxidase antibody. 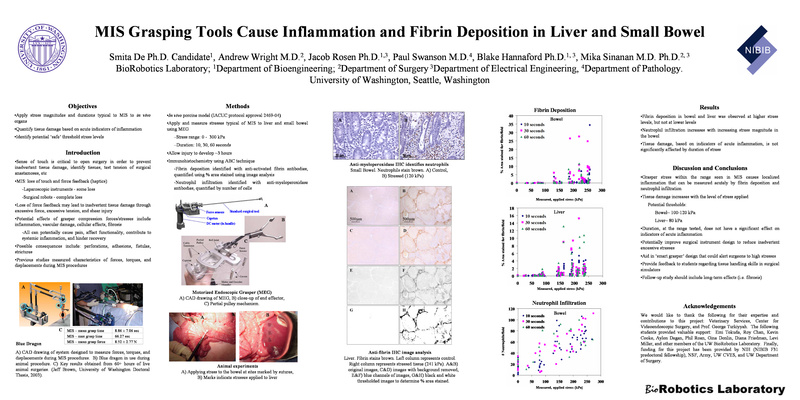 Fibrin deposition was identified in liver with an anti-fibrin antibody and quantified using automated image processing. Each measurement point (stress and duration) was assessed in quadruplicate.